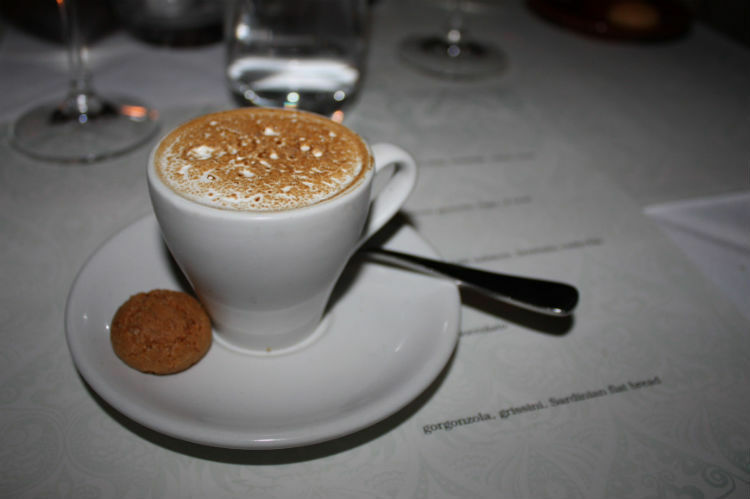 The other night we had an Italian degustation at Omerta, a restaurant in Darlinghurst. It was divine. I am a little sad though that the photo of one of the courses did not turn out – I was too excited because it was simply amazing. I will however attempt to describe it in detail. This dish was the perfect way to start the degustation. 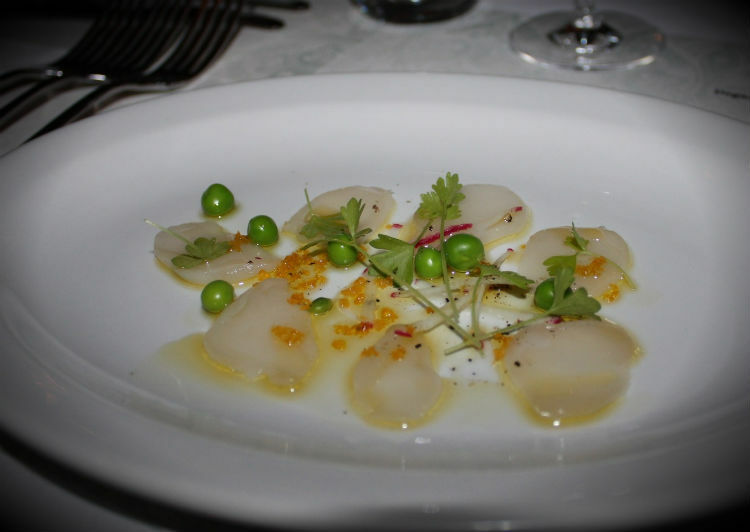 The stronger flavours of the cured scallops were muted by the celery cress, and an extra bite was added by the bottarga. I’m not set on the green peas working well with the dish, but then again I’m not really a fan. I am gutted I don’t have a photo of this. My hands must have been shaking – this was definitely the favourite of the night. The gnocchi were light and creamy and the beef was slow-cooked to perfection. 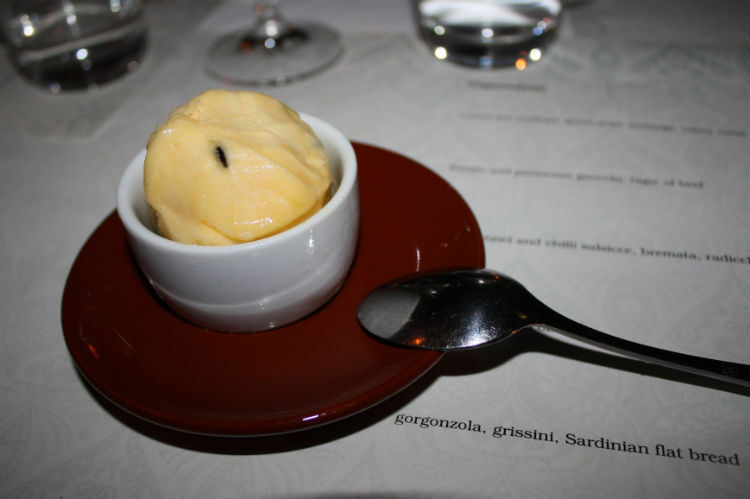 The combination was melt in your mouth – I would go back to Omerta for this dish alone however I can’t see it on the menu – this degustation was a special deal on one of the daily deal sites. I don’t even know what bremata is. Maybe the polenta-style sauce that this dish was laid upon? 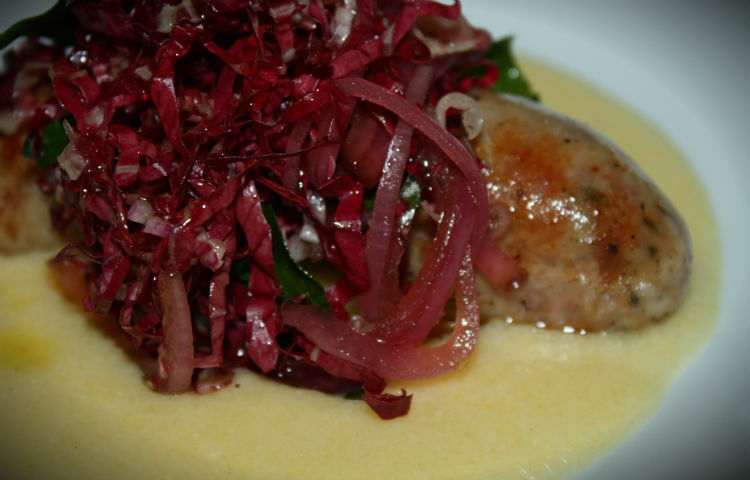 The sausage was tasty and not greasy, and the radicchio added the right amount of tang. The sauce was perfect because it wasn’t too rich and creamy. This was definitely the second favourite dish. The soft marshmallow-like topping turned into layers of meringue, amaretto biscuit, caramel and a chocolate fondant/mousse at the bottom. The combination of flavours and textures was to die for! I didn’t get a photo of this one for two reasons – I was too full and I wasn’t fussed over it. Gorgonzola isn’t my favourite blue cheese but the combination of the cheese, flat bread and slivers of fig were a delightful sweet and savoury finale to a night of incredible dishes. mascalzone, and you did’t take me to this place during my visit!!! haha!